First National Bank Omaha, a subsidiary of First National of Nebraska, is the largest privately held bank in the United States. Chartered and headquartered in Omaha, it provides a wide range of banking services to clients in Nebraska, Iowa, Colorado, Texas, Kansas and Illinois. Throughout the Midwest, there are over a hundred branches of the bank. 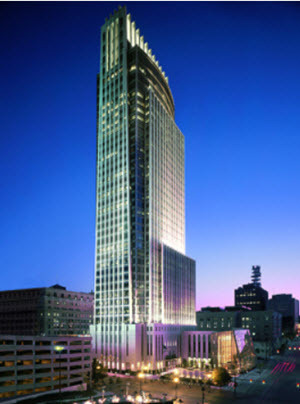 The First National Bank Tower is 45-story skyscraper located at 1601 Dodge Street in downtown Omaha. This is where First National of Nebraska, the parent company of First National Bank Omaha, is headquartered. Completed in 2002, this 634 ft building is currently the tallest in the city and in the state of Nebraska. Across from the building is the First National Bank Park. First National Center is a 22-story office building on 1620 Dodge Street in downtown Omaha. Attached to the building is a the 19-story 420-room DoubleTree by Hilton hotel. Within this business park, First National Bank occupies 14010 FNB Parkway. There is also a bank branch at 14310 FNB Parkway. First National Bank Omaha has its roots in the mid-19th century. In the 1850s, the brothers Augustus and Herman Kountze founded the Kountze Brothers Bank, which would eventually become the First National Bank Omaha. Both brothers were businessmen and investors with major land holdings along the Missouri River. Edward Creighton, another Omaha business pioneer, was appointed president of the bank, which received national charter #209 in 1863. The bank traded chiefly in gold dust and buffalo hides. In 1866, another Kountze brother named Charles Kountze founded the Colorado National Bank, with Augustus as a senior members. In 1868, the brother Luther Kountze opened a Kountze Brothers Bank in New York City, also with Augustus as senior member. In 1913, First National Bank created a Ladies’ Department, making them one of the first North American banks to specifically target female clients. This department was staffed with female tellers and helped making banking more approachable and mainstream for women. The Great Depression was a tough period for banks in the United States, with over 750 banks closing in Nebraska alone. One critical point that First National Bank manage to survive was a bank run that took place in Omaha a Saturday in August. Depositors began to withdraw their funds en mass from Omaha banks, to which First National Bank responded by extending their opening hours and honoring every requested bank withdrawal. This proved the solvency of the bank, and helped ease depositors’ fear of losing their money. In the 1953, First National Bank became the 5th bank in the United States to issue their own credit card. 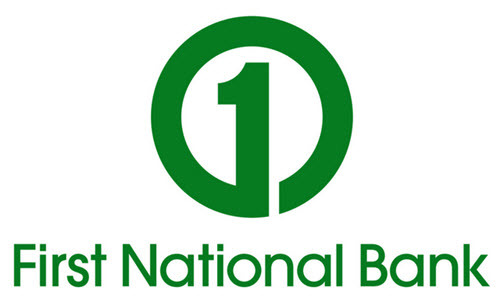 The other four banks were located in other parts of the country, making First National Bank the first bank in this region with their own credit card. 1953 was also the year when First National Merchant Solutions were launched and started processing for 125 merchants.